More ruins from the Lubbock tornado. I was in junior high in 1970, and like everyone who lived in Lubbock then, have clear memories of the storm and its impact. My dad, a civil engineer, was one of the people who had immediate access to the heavily damaged portions of downtown, and he took pictures of what it looked like. They are frightening. We still get big storms in the spring, but never again a tornado like that one. Here’s a reenactment of the City’s emergency management response the night of the storm. It’s equal parts corny and historic, but watching it makes my memories seem more recent. 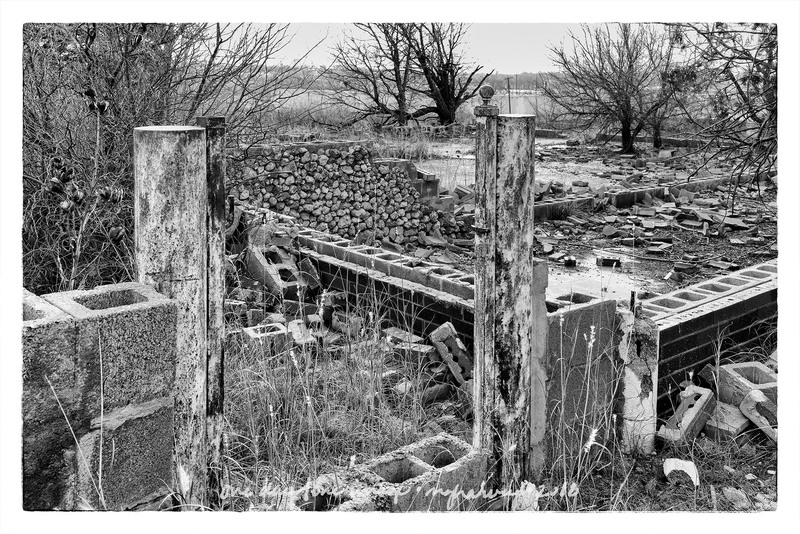 Posted on January 26, 2018, in Photography and tagged 365 photo project, abandoned buildings, black and white photography, learning to see, Leica, lubbock, lubbock texas, Lubbock Tornado, May 11 1970, melinda green harvey, monochrome, one day one image, photo a day, photography, postaday, texas, thoughtful seeing. Bookmark the permalink. 2 Comments. I wonder how many share those moments with you. There’s a Facebook page for the Lubbock tornado, so I am most certainly not alone with these memories. Since I posted these images, I found out that one of my co-workers lives in a house that was rebuilt on the foundations of one that was demolished in the storm. The “new” house (it was build in 1971) has a door that was reclaimed from the wreckage of the original place. It’s just a couple of blocks from where I made this images.